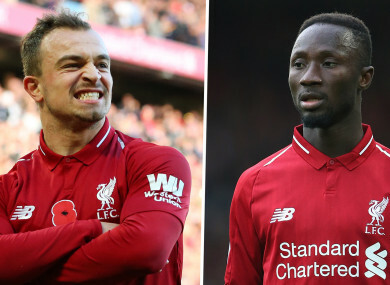 JURGEN KLOPP HAS assured Naby Keita and Xherdan Shaqiri that the pair still have a place in his Liverpool squad and explained why they haven’t seen as much game time recently. The duo have missed out in recent weeks and were not brought off the bench in Sunday’s 0-0 draw with Everton , despite the Reds searching for a late winner at Goodison Park. Klopp has, however, moved to ease any concerns that they are no longer part of his plans, insisting that he selects his team based on what’s required for the next opponent in question. “It is about our situation in training and what’s needed individually for the next opponent. That is all that we think about,” the German told reporters. We don’t stick to one formation or the other, but the boys need to offer. Sometimes it is more possible and sometimes it is not possible for different reasons. “Sometimes we don’t have the sessions. Then it’s more difficult to offer something. It’s all part of the decision-making. Keita started the campaign well after joining from RB Leipzig last summer for a fee of £53 million. However, the midfielder has played just six minutes during Liverpool’s last three Premier League games. “Naby is actually in a good moment and has trained well,” said Klopp. “It’s only been the last three games he didn’t play too much. The team is in a good moment and we feel in a good moment so it’s difficult if things are working out well in midfield. “If we play the system we usually play most of the time then there are only three positions [in midfield]. Somebody has to be out but it’s all good. They are all fit and we can use them all. As for Shaqiri, he has not started any of Liverpool’s last five league outings. “It’s similar with Shaq,” Klopp added. “He had a little injury and was out [for Bournemouth at home]. There was something with his back and he needed a little time. “I remember the moment when he got the injury – he won a heading challenge near the sideline. His body wasn’t used to that! It affected him. Email “Klopp explains lack of Liverpool minutes for Shaqiri and Keita”. Feedback on “Klopp explains lack of Liverpool minutes for Shaqiri and Keita”.